Nobody's Daughter Haewon [Nugu-ui ttal-do anin Haewon] is a poignant drama from director Hong Sang-soo (Woman on the Beach, In Another Country). Told in the chronological style of a diary, the story reflects a young woman’s emotional growth and search for meaning within a remote and isolated village on the edge of Seoul, South Korea. After her mother leaves for Canada in the hope of starting a new life, film student and aspiring actress Haewon (Jung Eunchae) begins to sink into a deep depression. In the hope of finding solace, she re-ignites an affair with her ex-lover, a much older married professor (Lee Sunkyun). But within the kaleidoscopic inner world of her emotions, her dreams slowly begin to interweave with her reality and evolve into something that will change her life forever. Thought-provoking and affecting, Nobody's Daughter Haewon is an involving exploration of modern relationships from one of Asia’s most distinctive directors. The film was nominated for the Golden Bear at this year’s Berlin International Film Festival and premiered at the London Film Festival on 9th October, which was followed by a cinema release on 11th October. Hong Sang-soo made his directorial debut with The Day a Pig Fell in to The Well in 1996. Praised by South Korean critics for its originality, the film received several awards domestically and internationally, including three for best new director. Since then, he has written and directed thirteen films, many of them receiving critical acclaim for their portrayal and depiction of everyday human relationships. Notable among the awards he has received are the Un Certain Regard award at the 2010 Cannes Film Festival for Hahaha, and the Silver Leopard award for Best Director at this year’s Locarno International Film Festival for Our Sunhi. Renowned for his unique cinematic language and aesthetic, Hong Sangsoo is one of the most established auteurs in contemporary Korean cinema. 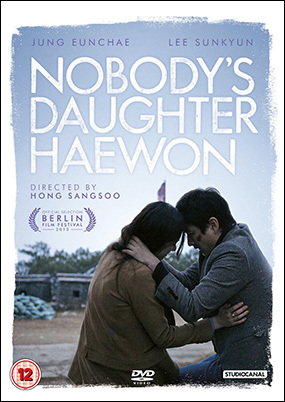 Nobody's Daughter Haewon comes to UK DVD and EST download on 4th November 2013 from Studiocanal at the RPP of £19.99 for the DVD.